Alastair Forsyth has defended the decision to play on at the Madeira Open after his caddie died of a heart attack on the Santo da Serra course on Sunday. 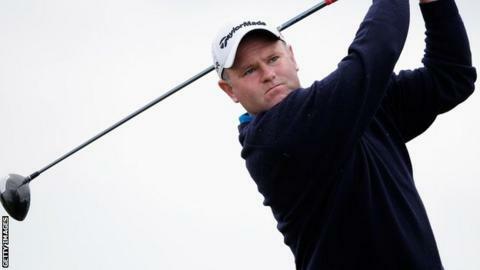 The Scot was playing the last hole of his round when 52-year-old Zimbabwean Iain McGregor collapsed on the fairway. An indefinite suspension of play was initially imposed and the European Tour's decision to then resume was criticised by a number of players. Forsyth responded by saying: "We felt that was what Mac would have wanted." Following the resumption of play, England's Daniel Brooks eventually beat Scotland's Scott Henry on the first play-off hole. "Everybody is in shock," Forsyth said after the tragedy on the ninth hole. "To see that happen to someone in front of your eyes... I don't know how or when you get over that." Forsyth said he and playing partners Adam Gee and Tano Goya had met tournament officials and spoke to European Tour chief executive George O'Grady before taking the decision to play on. "He was far too young for this to happen," added Forsyth of McGregor. "He was the life and soul of the caddies' lounge and a nice guy who will be sorely missed. I'm absolutely numb." The European Tour issued a statement on Sunday saying the players and caddies had been consulted before the decision was made to resume the tournament and that a minute's silence had taken place at the clubhouse. However, the decision was criticised by a number of players, including Sweden's Joel Sjoholm who had previously worked with the caddie. Sjoholm, who missed the 18-hole cut in Madeira, wrote on Twitter: "Can't believe that they are sending out players to finish the second and final round when someone just died on the course!!! R.I.P my dear Mac. Way too young. This going to be a tough evening." Spain's Gonzalo Fernandez-Castano responded to a tweet saying it was "a pity" the tournament had continued by posting: "I can't agree more #shame." Others took to social media to pay tribute McGregor, with nine-time major winner Gary Player posting on Twitter: "RIP Big Mac. You will be missed. My condolences."